Photo Courtesy of Mike Severns, Molokini, Maui, Hawai`i. 150 feet. 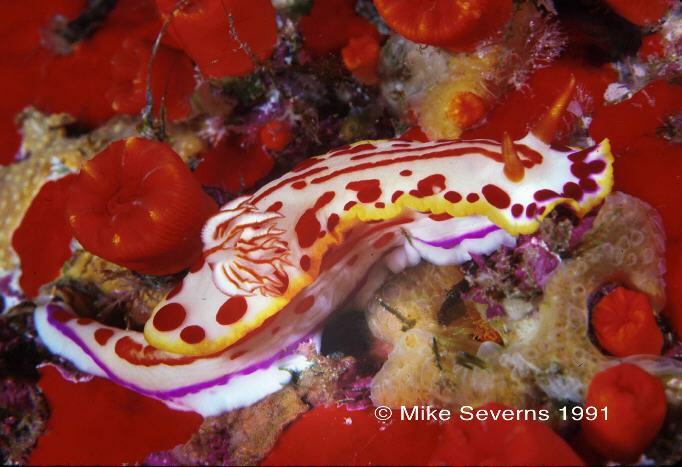 Only a few specimens of this flamboyant nudibranch have been recorded. The first two were photographed in 1985 by Scott Johnson while he was diving off Honolulu Airport's reef runway at a depth of 90 ft. (30 m.). Because they followed each other in close proximity, like nudibranchs of the genus Risbecia, he thought they might belong to that genus. In 1991 Pauline Fiene-Severns observed a single specimen off Molokini Islet, Maui at about 150 ft. (45 m). It is illustrated above. One more was photographed by Steve Buck in 1998 on the wreck of the YO-11 off Waikiki, O`ahu, at about 75 ft. (24 m.). Steve's beautiful specimen appears smaller than the others and was found in slightly shallower water. The animal is creamy white with red lines and spots. Its mantle is rimmed with gold; a purple line encircles the foot. The rhinophores are red, the gills white edged with red. It attains about 2.5 in. (65 mm) and is known to date only from the Hawaiian islands of O`ahu and Molokini. One of its Indo-Pacific cousins, Hypselodoris kaname, is very similar in appearance. The species name honors Pauline Fiene-Severns whose abiding interest in Hawaiian opisthobranchs has resulted in many new records and discoveries. One of Scott Johnson's original photos appears in my book Hawaii's Sea Creatures as Hypselodoris sp. 3. Unfortunately, the species had not yet been named when the book went to press. Terrence M. Gosliner and Rebecca F. Johnson, 1999. Phylogeny of Hyselodoris (Nudibranchia: Chromodorididae) with a review of the monophyletic clade of Indo-Pacific species, including descriptions of twelve new species. Zool. Journ. Linnean Soc. 125:1-114, with 62 figures. Pauline Fiene-Severns is a biologist from Maui whose interest in nudibranchs is constantly renewed by the discovery of new species and the rare observation of any nudibranch "behavior." Together with Dr. Terry Gosliner and Cory Pittman, she is working on a book devoted to the Hawaiian opisthobranch fauna. Mike Severns is a biologist/photographer whose lifelong study of tree snails has led to diving some of the most remote parts of Indonesia. His photographs have appeared in numerous magazines and books, and with Pauline, he has produced two books of his underwater photography, Molokini Island, Hawaii's Premier Marine Preserve and Sulawesi Seas, Indonesia's Magnificent Underwater Realm. His most recent book, Hawaiian Sea Shells, is a comprehensive identification guide, and will be out later this year. 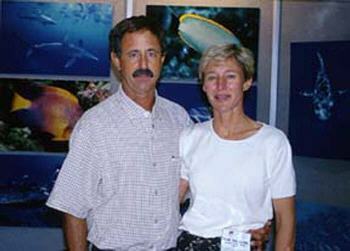 Together, Mike and Pauline are owners of Mike Severns Diving , a dive charter operation on Maui. Celebrating their 20-year anniversary, Mike Severns Diving offers certified divers in-depth marine ecology briefings and fascinating dives guided by an experienced Hawaii biologist or marine naturalist. For several years they have offered the only trips available world-wide to see an annual daylight coral spawning, in this case, Pocillopora meandrina. They also offer night coral spawning charters.